Once again I don't have anything too exciting to show you. 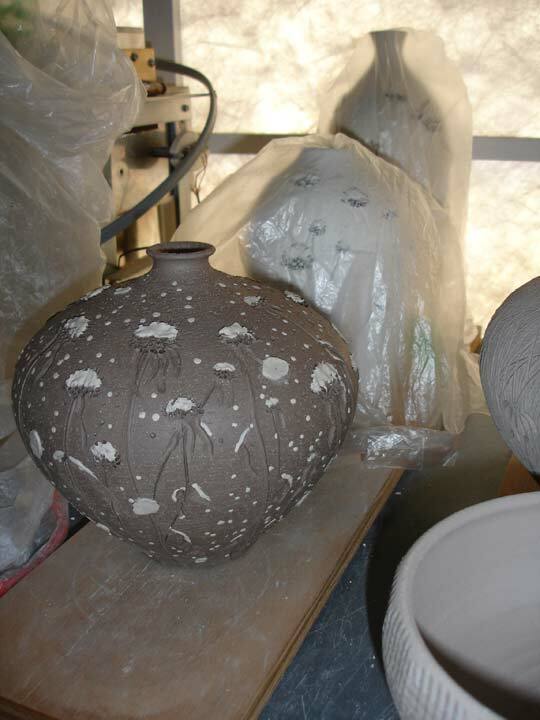 Everything is all white- bisqued pots, not finished glazed pots. This piece is big and elaborate and meant as a center piece. The design is inside and out. I am still enamored with making functional stuff and have a lot to glaze. 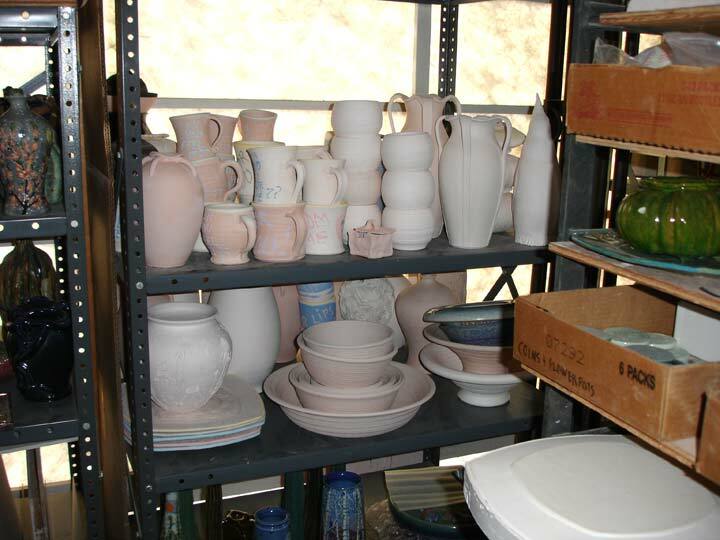 Some of it is meant for a different tye of kiln firing. They are for a soda fired kiln. 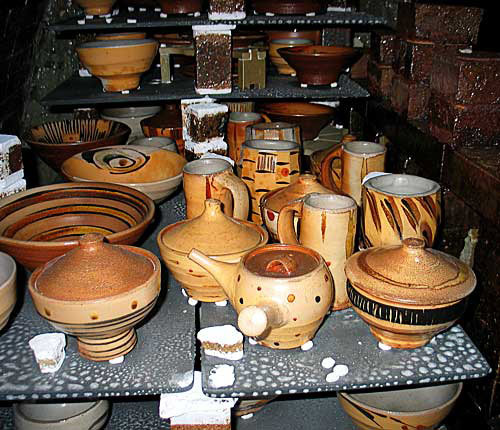 Soda firing is where the glaze of the pot is determined by the atmosphere in the kiln. Click this link for an explanation. 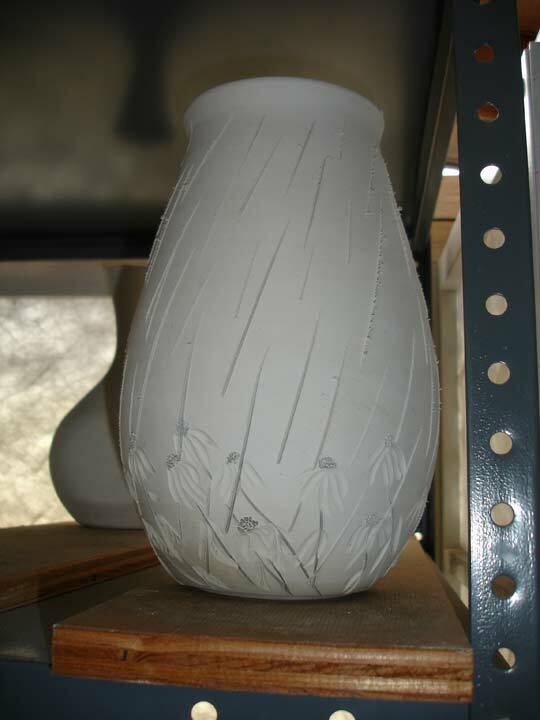 Here is the way soda fired pots generally look. It is just a different aesthetic. This is the most exciting thing I have made lately. 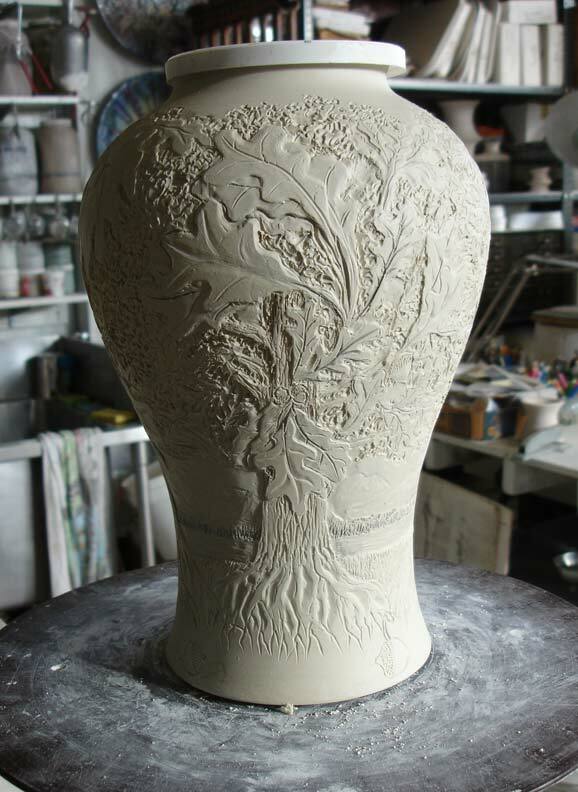 It is an oak tree pot with four trees and four panels with landscapes carved into them. This is the original for a mold. 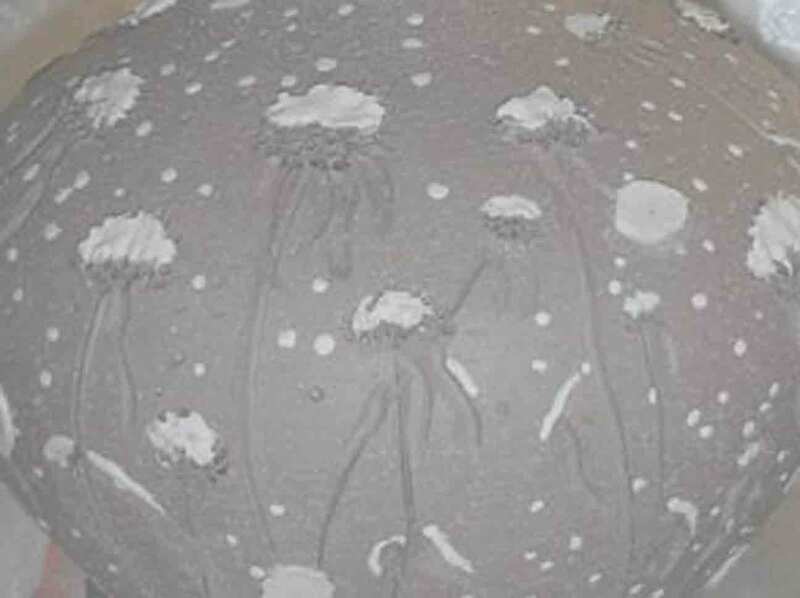 Why mold this pot? There are a number of reasons. I don't want to carve another as it takes too long. I want to be able to galze more than one. More than one person will want one. The price will be a lot lower if I can make more than one with the effort already expended. It will be glazed like the piece in front. Drippy, clear, glassy, runny colors. I can't wait! More pots for the soda kiln. I am making pots similar to past themes, but here I mix clays. The pot will be brown toned from the soda atmosphere and the porcelain snow will be white. Something different. 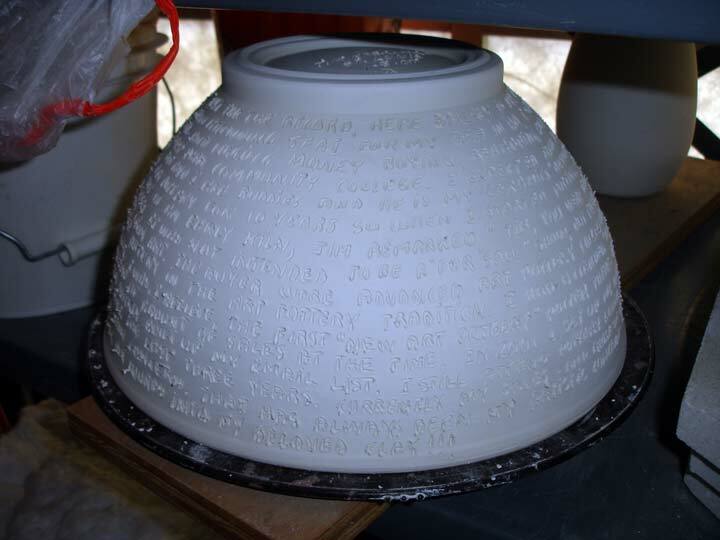 I am still writing various personal histories on pots. Here I am making an apparently simple pot that I hope will emulate a past super-duper pot that got away from me. 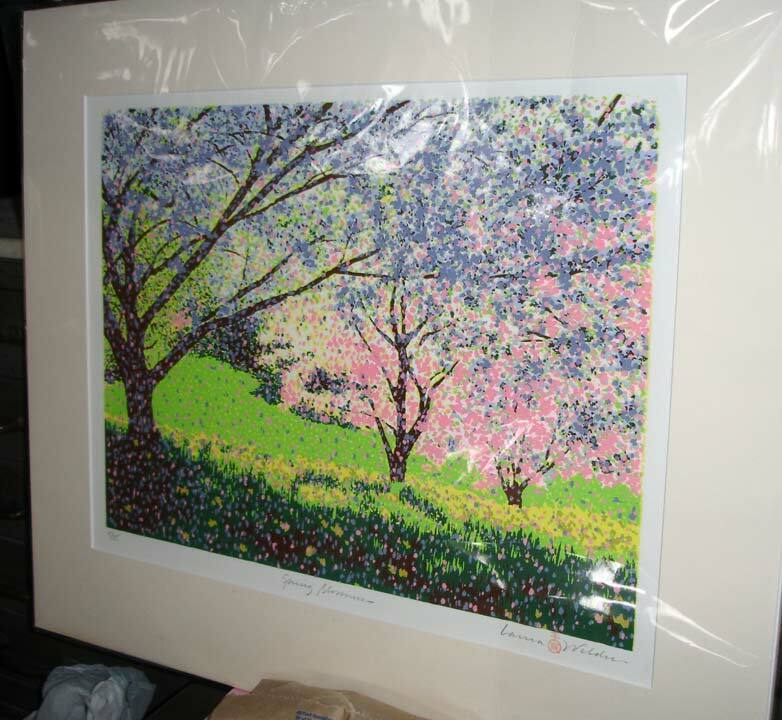 I buy a lot of art and rationize that buying by saying that I want and need the inspiration the bought object will provide. Here is the latest from Laura Wilder. And now for something completely different. I am going to give you stock pics. If you are in the market, buy these four. It will be a rocket ride for the next year- in my opinion these are a sure bet. CHL, AOB, INFY, OBCHX. If you like to play it extra safe, buy only the OBCHX as it is a ETF (mutual fund). Note that these picks are "buy and hold" choices. If they drop 5% in a day, don't worry about it and sit tight. Remember to spend some of your future profits on my pots! Repeat after me, "If Tim makes me a bundle in the market, I promise to spend 10% of my profits on Tim's pots." Hey, I am serious. Really! !